Custom Embroidered Mens Polo Golf Short Sleeve Shirts|Pique, Spot Shield, No Pill, No Shrink, No Fade, No wrinkle. Custom embroidered polo golf shirts continue to be the best all around garment for most small, large and corporate business. They offer comfort and style! Adding your custom embroidered company logo and you have reached a level of real professionalism in the work place. 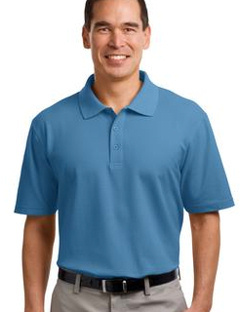 Port Authority silk touch polo golf shirts, Chestnut Hill performance polo golf shirts, Gildan DryBlend, Jerzees spot shield, custom embroidered with your logo offer a no shrink, no pill, no shrink fabric. 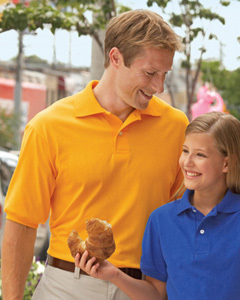 Cornerstone's industrial pique polo is also a winner with your embroidered logo left chest. 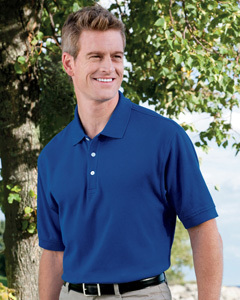 Choose from one of our embroidered golf shirts or custom polos and get noticed! 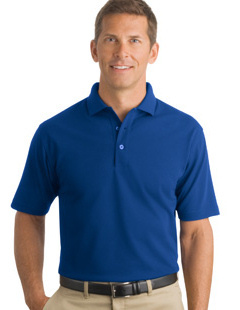 An indispensable polo for just about every uniforming need. Designed for everyday wear, this pique polo is made from a durable blend for lived-in comfort, traditional good looks and exceptional value. 4.4-ounce, 60/40 cotton/poly pique. Flat knit collar and cuffs. 3-button placket with dyed-to-match buttons. Side vents. Custom embroidery included! 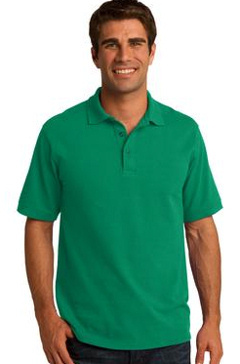 Custom embroidered G880 Gildan's 5.6 oz DryBlend polo golf shirt. 50% preshrunk cotton, 50% polyester; DryBlend® fabric wicks moisture away from the body; welt-knit collar and cuffs; woodtone buttons; double-needle stitched hemmed bottom; three-button placket .Custom embroidery included. Custom embroidered 437 Jerzees 5.6 oz jersey polo golf shirt, 50% cotton, 50% polyester preshrunk jersey; seamless body with SpotShieldT stain-resistant treatment; welt-knit collar; back neck tape for a clean, comfortable finish; double-needle stitched bottom hem; two-button placket with pearlized buttons; rib knit sleeve bands Custom embroidery included. With a soil-release finish, this budget-minded polo is exceptionally durable. 6.5-ounce, 50/50 pique knit cotton/poly. Soil-release finish. 1x1 rib knit collar and cuffs. Coverstitched shoulders, armholes and cuffs. 3-button placket with dyed-to-match buttons. Double-needle hem. Custom Embroidery Included. 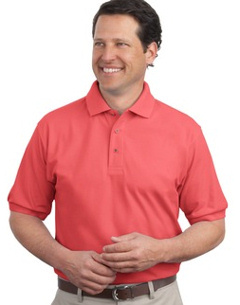 An enduring favorite, our comfortable custom embroidered Port Authority ® Silk TouchT Polo. golf shirt K500 is anything but ordinary. 5 oz 65/35 poly cotton pique, metal buttoms dyed to match plastic rims, side vents. With superior wrinkle and shrink resistance, a lightweight feel it's a great choice. Embroidered with your logo included! Custom Embroidery Included. 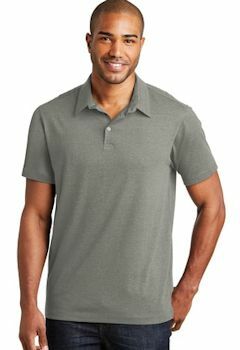 A refreshing departure from the traditional, this fresh polo has the naturally soft feel of cotton in a carefree blend. With a subtle texture, our Meridian polo is versatile enough to complement today's corporate and casual looks. 4.7-ounce, 80/20 cotton/poly. Self-fabric collar. Back yoke. 3-button placket. Metal buttons. Open hem sleeves. Custom embroidery included! We've taken our classic silhouette and added superior wrinkle and shrink resistance. Odor-fighting properties help minimize odor. We completed the polo with a soil-release finish for long-lasting, professional wear. 5.6-ounce, 60/40 cotton/poly pique. Double-needle stitching throughout. Flat knit collar. 3-button placket with dyed-to-match buttons. Open hem sleeves. Side vent. Custom embroidery included. Tall Sizes Available! Custom embroidered 7 oz. 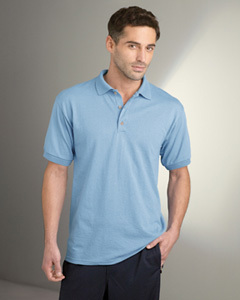 K420 Preshrunk 100% ring spun combed cotton Port Authority pique polo golf shirt. Garment washed for softness. 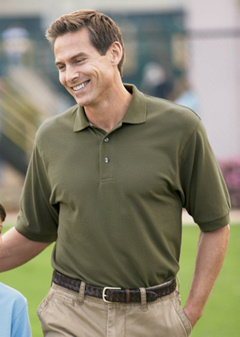 Our legendary pique knit sport shirts are soft and casual and a tried-and-true customer favorite. With an abundance of color and styles, these shrink resistant sport shirts are easy to care for and just get better looking over repeated washing and wear. Quite simply, you'd be hardpressed to find a better pique knit sport shirt that meets our impeccable standards. Horn tone buttons, side vents. Custom embroidered with your logo included. Tall Sizes Available! Exceptional custom embroidered industrial pique polo golf shirt by Cornerstone. 6.8 oz, 100% polyester, flat knit collar, dyed to match buttons, side vents. Hardworking, hard wearing CornerStone Industrial Pocketless Pique Polo. Built to take on the toughest jobs, this heavy-duty polo meets IL50 standards, which means it excels through 50 industrial launderings. 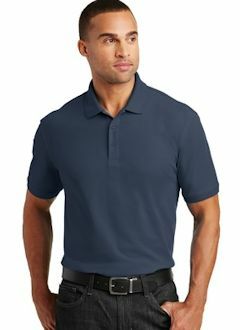 Comfortable and stain resistant, this polo has a stylish ottoman tipped collar-making it versatile enough to wear off-site, too. Custom embroidered with your logo included. D100 Devon & Jones Men's Pima Piqué Short-Sleeve Polo Golf Shirt. Exceptional custom embroidered D100 Devon & Jones Men's Pima Piqué Short-Sleeve Polo Golf Shirt. 100% Peruvian Pima cotton; Dura-PearlT buttons and rib knit cuffs; stretch tape in shoulders for extra strength; three-button placket; added yarn in collar and cuffs for appearance and durability; Grey Heather is 90% cotton, 10% polyester. Custom embroidered with your logo included.